I am on a plane right now, watching home renovation shows on HGTV, thinking about how much fun it is to fix things up. Doing projects around the house (last year I built an exterior staircase and made new kitchen countertops, the year before that I built a mudroom), coding and buding apps, and working w founders to improve companies (what we so at USV) are all the same – starting out with something with promise, seeing the vision for the potential, and doing the work to fix it up. It is just so satisfying, so fun, and so rewarding. It’s also scary and stressful, full of unknowns. Luckyfor me, both as a DIY home improver, and as a self-taught coder, and now as a yeoman venture capitalist, it’s easier than ever to learn from the outside. I learned how to code by reading books, using open source code, and by benefiting from the questions and answers if countless others on stack overflow.I learned how to build and fix homes from a short stint working in construction after college, but now mostly by watching videos on YouTube. But anyway, point is just that making things, and fixing things, is just the best. It’s my favorite thing to do, and what I plan to do in as many ways as I can, for as long as I can. Last week I organized this all-day Practical AI workshop for women in SF. 60+ women got hands-on making Alexa skills and wrangling with Python code in Jupyter notebooks whilst analyzing the biases in Stanford Glove data set. One attendee (a non-coder) said the workshop had “completely overcome her fears” that she wouldn’t be able to make or build anything in AI. As we learn how to do things, ours is the opportunity to share that knowhow with others. (1.) Our turn-up rate was 49%. This compares with the typical 30% for folks who sign up for tech meetups, including mostly male ones. So this is proof that female talent is very much interested in getting hands-on with AI. (2.) The usual male:female of AI workshops I’ve attended has been 25:1. We switched it up to 1:16. (3.) 26 people at LinkedIn have now watched that YouTube video which analyzes how “engineer” may be gender-associated with guys in the algorithms. This then means that “engineer” positions may be presented to men a lot more than to women — even as diversity&inclusion initiatives are hoping for more female engineers. 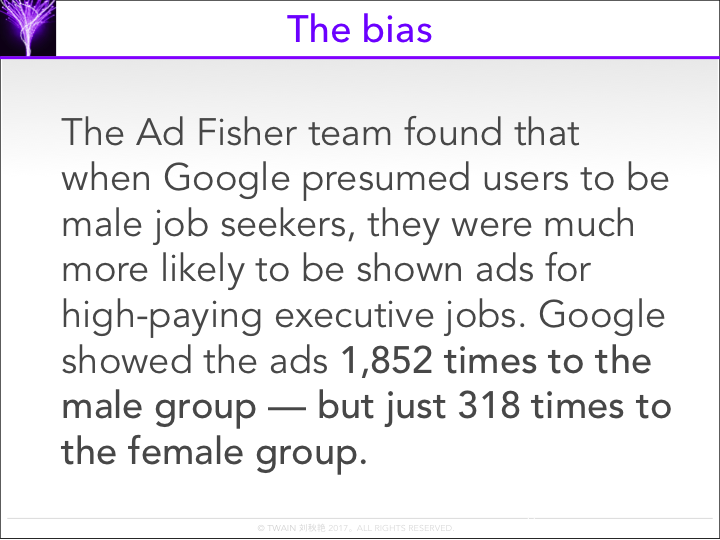 So these are the types of systemic data and algorithm biases which men+women need to hands-on fix, together. What you describe is a balance between the intellectual and the physical — where man is supposed to live. We are supposed to be thinkers AND doers. We are supposed to LIVE life, not observe it and we are supposed to take a few risks along the way, to test ourselves not for the outcome, but for the test. To learn who we are and what we are capable of. Pity the poor man who has never used a chainsaw, a hammer, or a powerwasher. Equally pitiable is the man who has never set a course and taken a risk — tested himself against the world. You are not a sailor (literally and figuratively) until you have sailed out of the sight of land and had but your boat, a compass, and the wind. And, your brain and pluck. The balance this draws, particularly for people who primary function is intellectual, is what makes us whole. Before I got an MBA and went into business, I was in the Army and was a paratrooper and Ranger. Everything I ever needed to know to found and run a company, I learned in the Army as a platoon leader and a company commander. It didn’t take as much courage to build a high rise office building the first time as it did to jump out of an airplane. I learned to fly when I was 50 because I wanted to be scared and challenged again. Flying delivered on both fronts. Every man has 5-7 careers in himself and at least 20 interests. @JLM:disqus @nickgrossman:disqus Thank you guys. You just put words on something I’ve been thinking about for a few years now: how to explain the need of ‘craft’ or even ‘dirty work’ when you hold an « intellectual » job. Now let’s go fix some things.